Stock Market Investment—Stocks and Options is a comprehensive introductory course on the stock market. It is intended to provide the reader with a structured learning tool and practical ready-reference resource that will appeal to lay people who want to become familiar with the complexities and risks of the market, seasoned professionals who want to brush up on the latest analytical tools, educators who need effective course material. 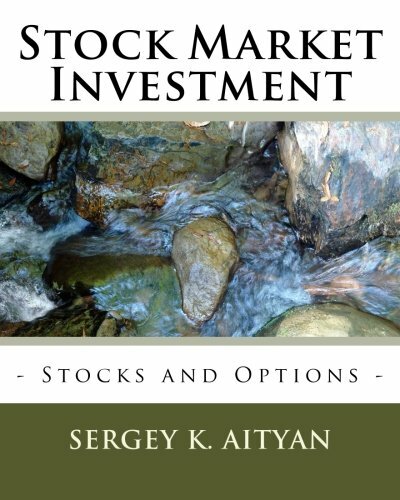 The book introduces the reader to stock exchanges, stocks, and options in their variety of forms. Topics include long and short stock and option positions, and advanced combinations of options such as covered and protective calls and puts, straddles, strangles, spreads, butterflies, and condors. Each chapter features a succinct, introductory discussion of the topic, augmented with clear charts and examples. Chapters conclude with questions that probe the reader’s understanding of the course material and are followed by practical exercises that will hone the reader’s practical application. The reader is introduced to major U.S. stock market indices such as the Dow Jones Industrial Average, Nasdaq Composite, S&P 500, and major international indices, their roles, and the algorithms used to calculate price-weighted and value-weighted indices. The mechanism of stocks and options trading and their quotation systems are described and explained for securities and over-the-counter (OTC) trading systems. The role of market makers is explained. The reader will learn how bid and ask are formed for listed securities and the OTC market. Detailed mechanisms of trading stocks and options, order types and parameters, trading queues, and executions are explained, including long and short orders; market, limit, and stop orders; order triggers; timing and other order parameters; and active and passive execution queues. Margin requirements are described, and explained in detail. The book also presents an introduction to market analysis, including fundamental, technical, and sentimental types of analysis. Major stock and company valuation approaches are discussed as part of fundamental analysis. Market capitalization, enterprise value, and book value of a company are explained. The impact of general economic conditions on stock performances is explained. Company and stock performance parameters such as profit, operating margins, earnings per share, P/E ratio, PEG, and dividends are described and explained. Notions of assets, capital, equity, liability, debt, and major financial ratios are introduced and explained. Quarterly reporting of all publicly traded companies and GAAP system are discussed and explained. The technical analysis chapter discusses stock time series and historical charts, major technical parameters, and indicators such as trading volume; SMA and EMA; trend lines; support and resistance lines; stock price momentum; and oscillators, including RSI, MACD, OBV and others, price and return volatility, Bollinger Bands, correlations including asymmetric correlation analysis, historical, and adaptive patterns. The sentimental analysis chapter explores the investors’ perception of stocks, companies, industries, sectors, and economy as a whole. The reader is introduced to the concept of market efficiency and psychological aspects of investors’ behavior, including surprise and panic behavior. The neoclassical concept of the utility of money, as well as the principles of prospect theory, behavioral economics, and the theory of general value are presented and explained. These principles build the foundations of behavioral investment, a new approach to market analysis. The book provides an overview of the major laws and regulations that govern the U.S. stock market. The roles of the Security Exchange Committee (SEC) and Financial Industry Regulatory Authority (FINRA) are described and explained. Instructors may request PowerPoint lectures for this course by sending an email to aityan@lincolnuca.edu. If you have any questions about this product by Aityan Sergey K, contact us by completing and submitting the form below. If you are looking for a specif part number, please include it with your message.